Empathy Afterplant is a biologically active general plant food for herbaceous perennials, edibles and trees, incorporating natural sources of nitrogen and potassium as well as rootgrow mycorrhizal fungi, which work with the roots in natural harmony to stimulate stronger roots that absorb mroe feed and are more disease resistant. 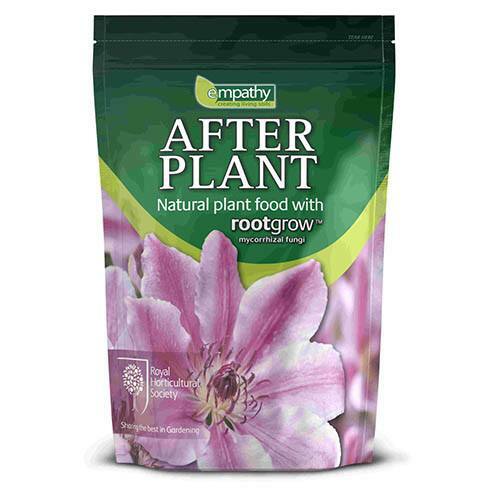 Empathy Afterplant contains Alfalfa, as a source of plant derived nitrogen, required for top growth and greening. Together with seaweed meal and green compost as sources of potassium, required for flowering and fruiting. The humates in Empathy Afterplant offer sources of organic acids that are essential for soil fertility. Plants in the Ground: For trees shrubs and fruiting plants use 2 -4 handful (25 – 50g) around the base of the plant, lightly worked into the soil and water well. for larger established plants apply 2 handfuls per square meter under the canopy of the plant.